The Macally TriHub7 can connect up to 7 USB 2.0 devices at once. 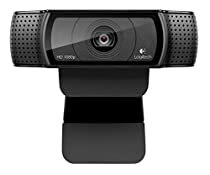 This includes any external Hard Disk, Flash Drive, Phone, Tablet, Webcam, MFP, Printer, Scanner, Mouse, Keyboard, Bluetooth Dongle and many many other USB 2.0 devices. Your PC or laptop usually has 2 USB ports or less. Macally TriHub7 will come in handy! The triangular shape will take up minimum space and keep your desktop organized and tidy. Tilt ports are easily accessible. Silicon mounting pads at the bottom can make sure the the hub stands upright. 5 feet long USB cable can run from the hub to your computer tower on the ground, saving you the hassle of reaching around to the back to find the ports. The USB cable is built into the hub so no worry coming out of the hub when things are being jostled around. Instead of relying on the limited current (0.5A) from Laptop/PC USB port, the TriHub7 comes with a power adapter that provides 5V/2A for connected USB devices. This can ensure that multiple USB devices will be properly detected by the OS and function with sufficient power, especially for high-powered device like external Hard Disk. • Dimension: L 5” x W 1.4” x H 1.4"
191 of 193 people found the following review helpful. I purchased 2 of these and love the design. I was trying to find hubs that had the ports on the front with no wires from the back. I found that hard to find until these. The USB cable is hard wired into the side. The AC is plugged into the same side and that can be disconnected. It is triangular shaped and comes with mounts to stick on a surface. I have both mounted under my studio desk with the ports faced in the back. I had to use superglue as the adhesive mounts kept coming off...probably had to do with the surface of the desk. Not a problem at all for me. Keeps everything organized and easily accessible. Quality build and does not feel cheap. 2 usb ports are spaced out further to allow access to bulkier usb products. Lately I noticed my PC would hang when booted. I would have to disconnect the hubs. Once I did that the PC would boot. I tried to narrow it down to which USB device was causing the hang and no luck. A couple days later I wondered about unplugging the AC from the hubs to see if that would help. So I disconnected them from the outlet and plugged back in...no more hang. It's like it had to be reset or something. Both USB ports are working like they should. I have 14 usb devices hooked up and all are working. I purchased a new pc and switched the hubs over. I am now running Windows 7 and no problems at all. 58 of 59 people found the following review helpful. I'm pleased with my purchase of this product. Some of the reviewers don't seem to realize that a USB port delivers 500ma to anything that's plugged into it. 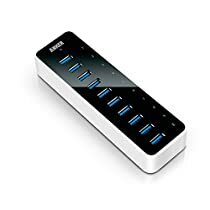 So, if you plug a 4-port USB hub that does not come with an AC adapter into a USB port on your computer, the hub itself will draw about 100ma and that will leave a total of about 400ma for the four ports. If, for instance, you need a USB hub and you have four devices that draw less than 100ma each, then you don't need the Macally AC powered USB hub. A USB hub without an AC adapter will be just fine for your application. 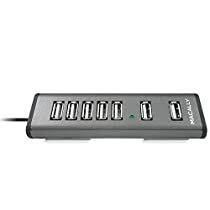 However, if you, like I, need four extra USB ports, each capable of delivering 500ma to whatever you plug into it, then you are going to need a USB hub like this one that comes with an AC adapter. No way around it. This usb hub is great. 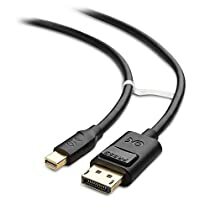 It connects my keyboard/mouse/webcam/external HDD to the laptop. Everything works fine. 2. It's a powered usb hub. I have connected two external HDDs to it and everything is OK.
3. Finally a usb hub without the BIG DAZZLING LED which you can find on nearly every hub! This hub only has a small green led. 1. Some of the ports may get hot when using the power adapter. It's OK. But I suggest that you disconnect the power adapter when you just use some low power consumption usb devices. Now I am not so happy about the product. The devices connected to the hub frequently stop working. I have to unplug the hub and some of the devices to reconnect them to the PC. I am not sure whether this is a universal problem for all USB hubs.